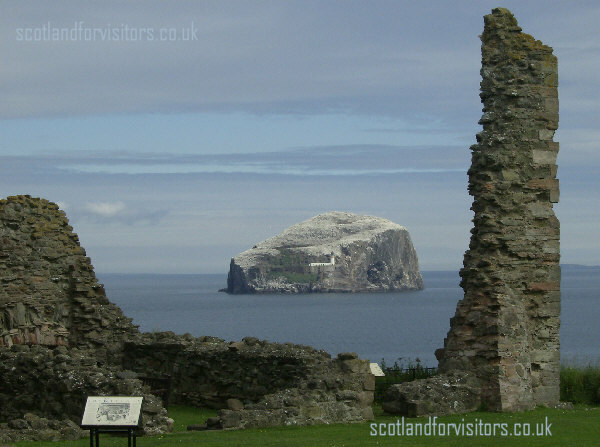 This is a photograph taken from the grounds of Tantallon castle, part of which provides a "frame" for the distant Bass Rock. Bass Rock is a rocky outpost (not really but almost an island) off the coast of Scotland lying in the Firth of Forth. Comprising a lighthouse and a huge seabird population, this outpost also played host to military barracks/ castle and a small chapel church at one time. The white colouring on the rock isn't snow nor paint. It is the inevitable remnants of 40,000 gannets feeding!